P2271, P2273 code - The Powertrain Control Module (PCM) detects the Downstream O2 sensor does not transition from a rich to lean condition within a specific time during a DFSO event. Default action this DTC the MIL light illuminate. - Ambient temperature above -7°C (19.4°F). - Battery voltage above 11.0 volts. - Fuel level above 12%. - With the engine running for more than 90.0 seconds. - ECT temperature above 70°C (158°F). - Catalytic converter temperature between 500°C (932°F) and 850°C (1562°F). - Upstream closed loop fuel control active. Engine speed above 1152 rpm. Throttle open for a minimum of 120 seconds. Immediately after a closed throttle decel fuel shutoff (DFSO) event. Check for contaminants that may have damaged the O2 sensor: contaminated fuel, unapproved silicone, oil and coolant. After the repairs have been made, verify proper O2 sensor operation. 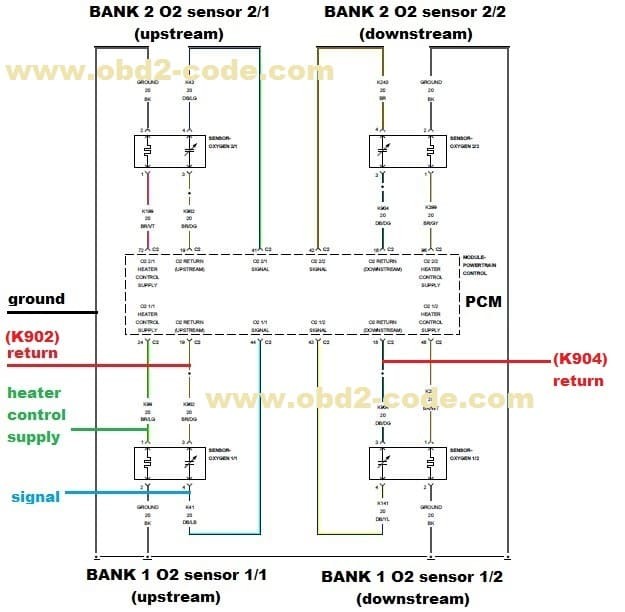 If all the O2 sensor voltage readings have not returned normal, follow the diagnostic procedure for the remaining O2 sensors. Start the engine, test drive or operate the vehicle in accordance with the when monitored and set conditions. With the scan tool read DTCs. Perform the CHECKING THE EXHAUST SYSTEM FOR LEAKS test procedure. Were any exhaust leaks found? Yes, perform the appropriate repairs. Turn the ignition off, disconnect the O2 sensor harness connector. Turn the ignition on, measure the voltage between ground and the O2 sensor signal circuit in the O2 sensor harness connector. Is the voltage between 4.1 and 5.0 volts? Measure the voltage between ground and the O2 sensor return circuit in the O2 sensor harness connector. No, check the O2 sensor return circuit for a short to ground, open or short to voltage. If OK, replace and program the PCM. Check for signs of contaminants that may have damaged the O2 sensor, such as contaminated fuel, unapproved silicone, oil and coolant. 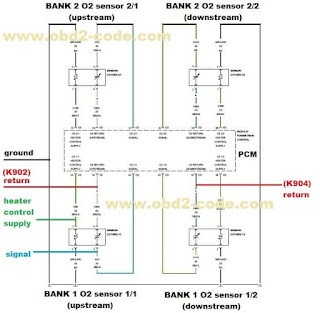 Using the wiring diagram/schematic as a guide, inspect the wiring and connectors between the O2 sensor and the Powertrain Control Module (PCM). - Look for any chafed, pierced, pinched or partially broken wires. - Look for broken, bent, pushed out or corroded terminals. - Verify that there is good pin to terminal contact in the O2 sensor and Powertrain Control Module connectors. - Perform any service bulletins that may apply. No, replace the oxygen sensor. 0 Response to "P2271, P2273 O2 Sensor Signal Stuck Rich"